The kotatsu is an old and traditional Japanese furniture to keep the body warm in the cold months of winter. 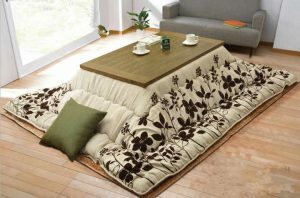 If are you about to purchase a kotatsu table for your house? Wait, because there are so many thing which we need to discuss to buy the best of this table. Following I am sharing with you detailed Kotatsu FAQ section. This will answer your so many questions related to it and help you to buy the best for your house. 1 - What is a kotatsu? The kotatsu is a low table which has been covered with a heavy blanket. It is different and unique because this table comes with a heating element on the underside. It is a traditional Japanese way to keep you warm. One can put his/her legs under the blankets in the heated space. 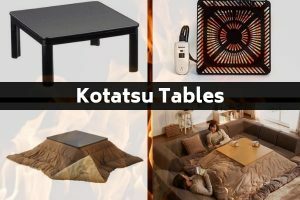 2 – Are “kotatsu” tables really as comfortable as depicted in anime? The short answer to your question is yes. The kotatsu tables really as comfortable as depicted in anime. The concept of this table itself is very unique and invented by the people of Japan. Even if you don’t have the kotatsu heater under the table, it will still provide you with very comfortable feelings due to the blanket of kotatsu. 3 – How do Japanese people wash their kotatsu blankets? In Japan, the kotatsu blankets have been washed in the same ways as other futons and regular blankets. The most Japanese take their these blankets to the local coin laundry for the washing purpose. There is also the option of dryers available to dry them quickly. 4 – How do I keep my cat warm throughout the day in Japan during winter? Use the same Japanese furniture for your cat which you are using for yourself to keep warm. I am talking about the kotatsu which comes with the table, blanket and a heater. It is perfect furniture to keep yourself and your car warm through the day during the winter. 5 – Is it common for students to own kotatsu in their small apartments? In Japan yes, even there is a survey conduct to get the right figure. According to many websites, more than 40% of students own kotatsu in their apartments and there is no figure whether their apartments are small or not. 7 – What is your favorite item from Japanese culture? Japanese culture is rich in every field of life; whether its food, medication, living style or even the furniture. One of the best things about furniture from Japanese culture is called kotatsu. It is heating furniture which keeps you warm in the cold weather. 8 – Why don’t we have heated furniture? In America, we don’t have heated furniture because most of the houses in the USA already have the heated system and heat floors etc. That’s why there was no need to the heated furniture a lot. But the tradition is being changed and people are now more interested in the heated furniture. 9 – What is the warmest material for a desk? Insulating material will keep the desk warm in the winter. You can even consider purchasing a kotatsu which comes with a heat source. It is a table which a heater under the table and a heavy blanket over the table. With the help of kotatsu, your legs will keep warm under the desk or table. 10 – How to save money on heat during winter? Having a fireplace in the house can save you money on heating during winter but this required to build a fireplace if you don’t have one. Another way to save money in the winter is using kotatsu. It is Japanese furniture which is used to keep the lower body warm with the help of heating system under the table and a heavy blanket over the table. 11 – How tall is a kotatsu? The height could be different as there is no standard size available. Usually, the height is 16 inches or 40 centimeters. 12 – What are low Japanese tables called? The low Japanese table is called kotatsu. It is a special table which has been designed to keep warm. The other low Japanese table is called chabudai and tatami. 13 – How high is a Japanese table? The traditional and modern Japanese tables are low in the height. If you start exploring the Japanese furniture, you will found that the average heights of their tables are between 15 cm to 30 cm. This is because of the Japanese people site on the floor and small height chairs. 14 – Where to buy a kotatsu table? In Japan, they are available in any small and medium-size market. If you are looking to buy a it in America, Canada, Australia, UK or any other country, then you can use the online resources to buy a kotatsu table. The best place is Amazon. The reviews of kotatsu tables available on Amazon are available which can help to purchase the best. 15 – Kotatsu in the US or Canada? Yes, it is available in the US or Canada. There are many companies who import Japanese furniture in the USA and Canada. They also import kotatsu table, heater, and blanket. You can easily purchase online. You can also import by your own by purchasing it from an authentic supplier from Japan. 16 – How to build an American-style Kotatsu? To build America style kotatsu, you need several things like a table with a lower height, heavy blanket and an electric or a small bathroom heater. All you need to fit the heater under the table and cover the table with a heavy blanket so that all the heat keeps there. Some people are using the traditional dining table in America to build an American style of this table which is not much different from the Japanese style. 17 – Is kotatsu table available in India? Yes, It is available in India at the cheap price. Actually the verity of these tables available to purchase only. One can even ask to make a customized kotatsu table in India at an affordable price. 18 – How to Keep Warm in winter in Japanese-Style? Kotatsu is a set of the table which has been used to keep warm in winter in Japanese style. The traditional way of using required to burn wood but today it has been replaced by the electric heater. 19 – What are the substitutes for kotatsu heater? If you are looking for the substitute for heater because you cannot effort it then you can go with a small bathroom heater. It is cheap and equally effective as the kotatsu heater. 20 – Is there any Kotatsu heater alternative? There are several heater alternatives available but among them, the most suitable is a bathroom heater because it is small in the size. In old tradition, the Japanese used to burn the wood at the place of the heater under the kotatsu table to keep it warm. 21 – How to make a futon for a kotatsu? One can make a futon simply by adding a heavy blanket over the table. You can add extra cotton to make it cozy and more comfortable. 22 – How and what is a kotatsu table used? In modern days, this table is used to get warm when it is cold outside. It is a low table made from a wooden frame and covered with a heavy blanket upon which a table top sits. It can be used for sleeping, playing family games and reading books. 23 – In the USA, Where can I buy a kotatsu? There are many options available to purchase it in the USA. One of the main website to purchase kotatsu is Amazon. We have reviewed some of the best of them on our website. You can also purchase from there after reading the reviews. We hope that this information will help you to find the best kotatsu 2019 for your house or even bed room. You can ask any related question back if you don’t find in the list above. Filed Under: Kotatsu FAQ's Tagged With: best kotatsu brands, Can you sleep under a kotatsu?, death by kotatsu, How tall is a kotatsu?, kotatsu bed, kotatsu floor sofa, kotatsu heater alternative, kotatsu uk, mini kotatsu, What are the low Japanese tables called?, white kotatsu, Why do Japanese sit on the floor?